The essential point about the French infantry company was that it was too small to operate as an autonomous military unit. 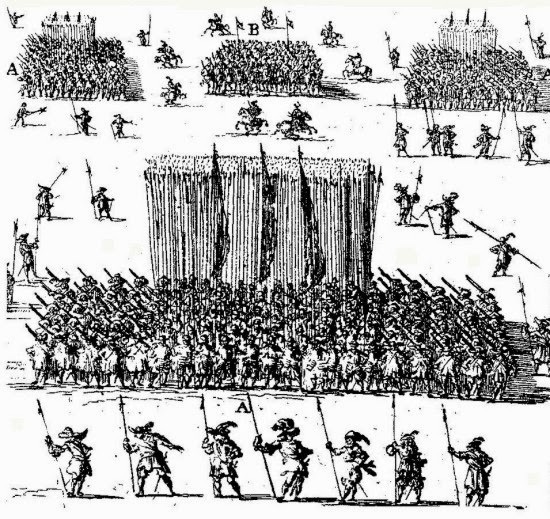 The simplest tactical formations of the period required substantially more than 30-50 men; the firepower of 20-30 musketeers would be of limited effect, and it was certainly questionable whether 10-20 pikemen could offer the cohesion and strength capable of protecting a body of musketeers, let alone launching an attack in their own right. Even at the level of raiding parties or a localized guerre de partisans, a company was too small to defend itself effectively, as numbers of reports of companies being wiped out by local populations attest. It might be assumed therefore that the regiment would provide a means to bring together the constituent companies into a militarily effective unity. But the fundamental problem with this solution was that `regiments' in no sense represented uniform tactical building-blocks. At their most extreme, the numerical differences between regiments could vary between 3,000 men for the gardes françaises at full strength, down to the point at which ordinary regiments were already marked for disbandment but still in service; evidence suggests that totals of 180, even of 150, infantry per regiment were possible by the last months of a campaign. On a more regular basis, generals would command an army-corps in which regiments could vary in size between 1,200 and 300 men. While a vieux regiment which had lost half its strength could bring together 600-700 infantry and was still capable of acting as an effective military unit, an ordinary regiment reduced to fewer than 300 effectives had probably reached the point where neither its firepower nor its cohesion in defence or attack would be sufficient in an engagement, even if the infantry in the unit had some military experience. These variations between the numerical strength of regiments created considerable practical problems for French commanders attempting to deploy their forces in battle or at a siege. The solution was clearly established, but proved difficult to achieve in practice. The remedy for discrepancies between the size of regiments was to deploy troops in an alternative formation for combat, the bataillon. 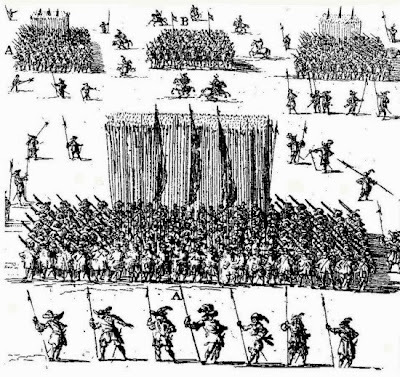 This was a unit with neither the administrative existence of the company, nor the clear identity of the named regiment; it was simply a uniform grouping of infantry into a formation of between 500 and 600 men, made up of pikemen and musketeers in what became the increasingly universal proportions of approximately 1:2. Jean de Billon refers to the bataillon as a unit of 500-600 infantry, assuming that the formation is no more than ten men deep, though he adds that `si on veut plus grand, l'on peut faire les files de vingt hommes au plus'. At a practical level, maréchal Bassompierre described in his mémoires how the French infantry being deployed for the assault on the pass at Susa in March 1629 were organized into bataillons of 50 enfants perdus, a supporting advance guard of 100, and a main block of 500 soldiers. Opinion remained consistent about the optimum size for a bataillon, and it is significant that this size corresponds to the Dutch battalion of 550 men, the smallest type of Spanish escuadrón of 600, the Swedish squadron of 504 infantry plus officers and NCOs, or the Imperial and Bavarian formations of 600. But the reason that this basic unit size was so universal appears to have nothing to do with any tactical theory of the superiority of small units. As both Billon and later writers imply, the real issue is simply the geometrical relationship between the depth of a formation and the width of its front. Formations of infantry drawn up on the battlefields of seventeenth-century Europe and facing an enemy advancing from a single direction were, in most circumstances, no more than ten files deep, and this depth was progressively declining towards a typical six files by the 1660s. Given this relative shallowness of formations, drawing up a large number of troops into a single block, pikemen flanked by musketeers, would run the risk of creating an over-extended and unwieldy front. A formation of 600 soldiers ten files deep would be numerous enough to be self-supporting on the battlefield, but would involve a front of sixty men. Drawn up in `close' order - which for the safety of musketeers equipped with matchlock muskets still implied three paces between soldiers - this formation would be only some 180 feet across, a manageable, sufficiently compact size for the transmission of orders by officers and NCOs. This was widely considered to be an optimum balance between firepower, independent cohesion and manageability.